Here are some notes on the wonders of the world. You may be familiar with the Seven wonders of the world. But here you can read about more wonders of the world. 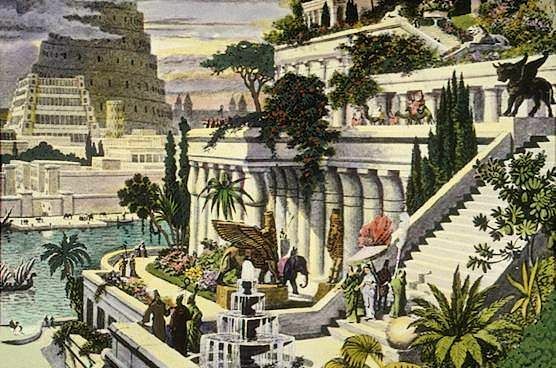 The city of Babylon, under King Nebuchadnezzar II, must have been a wonder to the ancient traveler’s eyes.According to ancient sources, Nebuchadnezzar had the Hanging Gardens built around 600 BCE for his wife Amytis. Amyitis was homesick for her verdant and mountainous home, and quite depressed living in the flat and arid Babylon. Thus an elaborate garden was constructed to replicate her lush homeland and cheer her up. When we hear about Pyramid the name of the country Egypt comes to our mind.Its the defining symbol of Egypt. Its one among the ancient Seven Wonders of the world. It is located on the plateau of Giza near Cairo, and built during the period of king Khufu (2589-2566 BC also known as Cheops).It was the tallest structure made by human hands until the construction of Eiffel tower. The Statue of Zeus at Olympia was created by the great Greek sculptor Phidias). The statue depicted the god Zeus seated on his throne. Height of the statue was 40 feet. The statue was carried off to Constantinople( present Turkey) where it was later destroyed, sometime in either the 5th or 6th centuries CE, by an earthquake. This temple at Ephesus was a Greek Colony in Asia Minor. It took over 120 years to build and only one night to destroy.The temple was 425 feet high,and 225 feet wide. It was built in 550 BC by the wealthy King Croesus of Lyd.It was a very magnificent one as it is written and that this was among the most amazing structures ever raised by humans. A man named Herostratus set fire to the temple. According to him he wanted to be famous by destroying something beautiful. The Alexander the Great was born on the day it was destroyed and he later offers to rebuild this temple but was refused by the Ephesians.but after that it was rebuild and again destroyed .